← Why Are Wild Pheasants on the Decline? When Prohibited Species Are Accidentally Caught? Answer: No, it is not considered an illegal action to accidentally catch a prohibited species as long as it is immediately released back into the waters it came from. Intentionally targeting a prohibited species IS illegal, but you do not seem to be doing that. As for how to avoid catching them, that’s a tricky question. About the only thing you can try would be to use a larger hook (that the garibaldi might have problems taking into their small mouths), but fly fishing generally doesn’t allow for use of larger hooks. 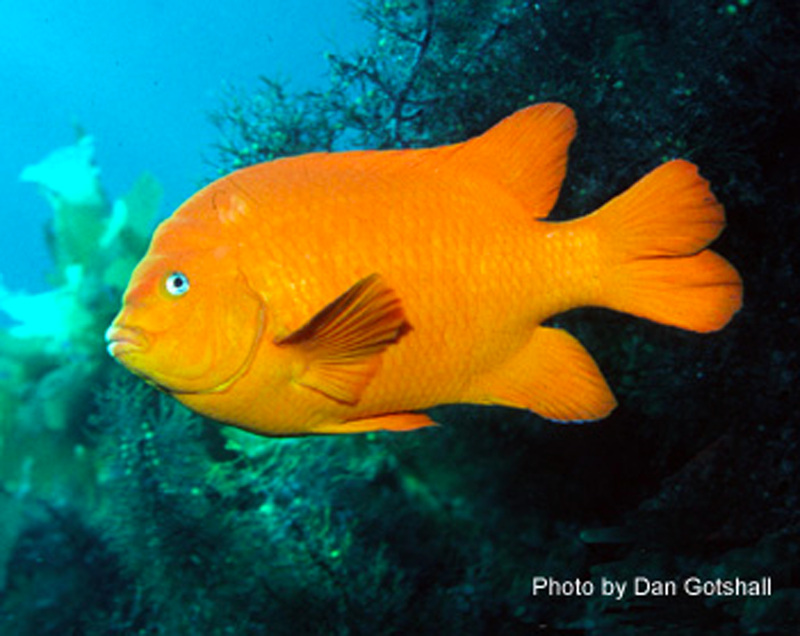 You may need to employ a bit of ingenuity to figure out how to reduce the number of garibaldi you end up hooking. What to do with banded waterfowl? Answer: Since waterfowl are migratory, the U.S. Geological Survey has the responsibility of collecting and analyzing all banding information. Government and private sector scientists and waterfowl managers tag and monitor migratory waterfowl every year. This banding information helps them to assess population numbers and track their movement patterns. You may also be asked to provide information about weather and any other waterfowl the goose was flying with when taken. Please go to www.reportband.gov to report banded birds. Capturing largemouth bass for a home aquarium? Answer: Transporting fish alive from the water where they are taken is prohibited (California Code of Regulations, section 1.63). Laws allowing certain species of live fish to be maintained alive in closed-systems do not authorize possession in home aquariums. Your friend can legally buy bass for his or her aquarium from a licensed aquaculturalist, as long as he or she does not release it into the wild. Qualifications for a disabled access hunting site? a mobility impaired disabled persons motor vehicle hunting license. You might also be interested in the special hunts for disabled persons conducted through the California Department of Fish and Wildlife (CDFW) during pheasant season. Information about these hunts can generally be found on our website in the fall prior to the season opener, at https://nrm.dfg.ca.gov/DFGSpecialHunts/Default.aspx. This entry was posted in Catch & Release, Finfish, Freshwater Fishing, Licensing/Permits/Stamps/Report Cards, Saltwater Fishing, Tackle, Uncategorized, Waterfowl and tagged fishing tackle, freshwater fishing, Licenses, ocean fishing, regulations, waterfowl. Bookmark the permalink.